As we commemorate the 1oo-year anniversary of the Russian Revolution, and with the Great Bear appearing to be waking from its post cold war hibernation, now seems as apt a time as any to explore some of Russia’s darkest and deadly history. 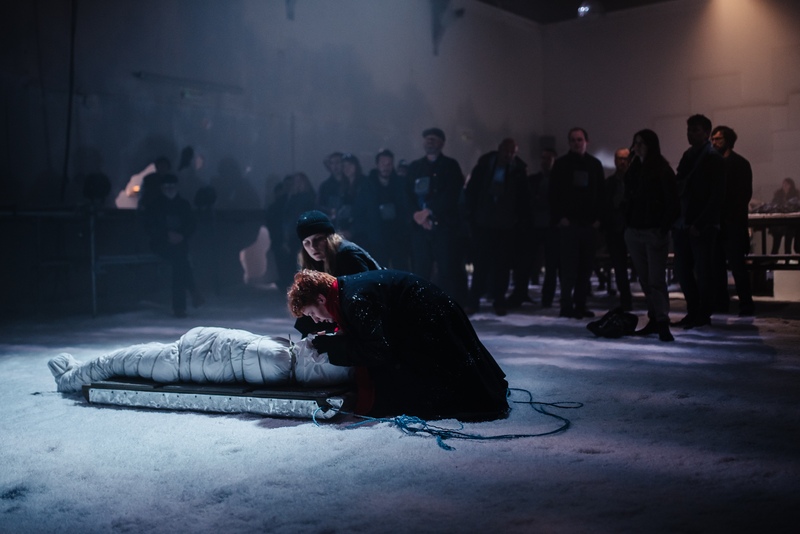 Raucous new production Ice Road delves into perhaps one of Russia’s most bloody moments, in the form of the Battle of Stalingrad. From August 1942 to February 1943 Nazi Germany & its allies besieged the Soviet Army on the banks of the Volga. Fighting house-to-house in the rubble of the former industrial powerhouse they wrestled for control of the city deep in Southern Russia. What followed was one of the single largest (nearly 2.2 million personnel) and bloodiest (1.7–2 million wounded, killed or captured) battles in the history of warfare. Trapped in the middle of the conflict (thanks to Stalin’s insistence that keeping them in situ would encourage greater resistance from the city’s defenders) were the citizens of Stalingrad. A sadly familiar tale, comparisons with the decimation of cities in Syria or Northern Iraq are obvious. Indeed, if one squints at the faded facades this could easily be the present day in Raqqa, Aleppo or Mosul – forgotten and forsaken. Estimates of civilian losses during the battle are spotty at best but the ravages of the battle soon left the city in ruins, with its resident’s living almost subterranean lives in the crumbling basements and factories, scrounging an existence, in the constant shadow of death. Set against this backdrop of desolation & horror we find four orphans (Leah – Heledd Gwynn, Tati – Elin Phillips, Zoya – Roamma Lewis & Kub – Alex York) scratching what life they can from the wreckage of their devastated city. Reviving Jacobs Well’s Road Baths for its venue Raucous have reinvented the Victorian pool as ‘Mother’ Russia. On entry we are handed a flower with which to “pay our respects”. Even the bar has been converted, with the audience surrounded by walls plastered with proletariat posters proclaiming party approved slogans, and are served by comrades dressed with babushkas and scruffy winter clothing. We drink vodka and wait for Uncle Joe to make an appearance. Instead a number of raggedly clad girls burst in on us speaking Russian, looking for a lost member of their youthful clan. It’s an impressively immersive start. As their Slavic accents give way to their natural Welsh, we are taken through to what one can only assume used to be the pool, for the main performance. With raised platforms, made predominantly from scaffolding, on three sides and another podium in the middle, the area is a vast expanse (as devised by designer Conor Murphy) on which Director Kate Hewitt and her cast are able to tell their tale. Carpeted in cotton wool, the very feel of the floor is as velvety as Siberian snow. Next we are formed into lines and asked to place our flowers upon the floor, before picking up old radios with names of long forgotten comrades and place them around our necks. This act of regimented collectivism really helps give us a glimpse, even if unintentionally, of what the robotic nature of life under Soviet Communism may have felt like. Mixing folktales, animation and the very accounts of those who were there together Raucous use the same formula that worked so well for them last year with their highly successful Stick House show. The animation (provided by Limbic Cinema, Tom Metcalfe, Thomas Buchanan Ltd, Aardman, Jack Offord & Zoe Power) has been taken to an all-new level with stories, and even booming Luftwaffe bombers, projected on the ceiling and walls and then onto the actress Heledd Gwynn herself, fusing the very performer and animation together flawlessly. A compelling narrative, at its heart a tale of betrayal, fuelled by the desperation of survival, as Leah leads this rag tag bunch as best she can with a combination of gallows humour and sheer determination. Also a reflection on the de-humanising effect of war upon a people we see the group fall further and further into the abyss as sorrow and their innate desire to survive compels them to do whatever they must, in what is essentially a return to the state-of-nature (defenceless as they are due to the collapse of any semblance of law or order). For all the tragedy and violence the piece is also an exploration of the indomitable human spirit. Flashes of inspiration provided by momentary escapism that can still be found, even in such dark places (in this case the playing of a clarinet). These poignant moments are amongst the high point of the performance and are used to great effect. Graphically bringing home the tragedy and inhumanity for those whose lives are forged in such tragic circumstances. Although it does so much right there are odd moments, such as the use of a tower of scaffolding at the far end of the hall. Which, whilst it provides some verticality, doesn’t appear to add much to the performance, and feels somewhat redundant. A compelling story, with a strong narrative and executed expertly Raucous’ Ice Road is a captivating, poignant tale that resonates with us as much now as it ever has. To find out more or get tickets click here. Tagged battle, bristol, Ice road, jacobs wells, Kevin Mcgough, Raucous, review, russia, russian, stalingrad, the fix, the fix magazine, theatre. Bookmark the permalink.